What is Output parameter in C sharp? 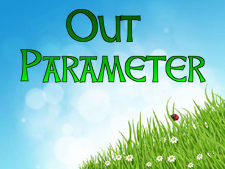 What is the advantage of Out parameter? How to use Out parameter in C# programming? Usually, a method returns value with return keyword. Unfortunately, a return modifier can return only one value at a time. Sometime, your C# program required to return multiple values from a single method. In this situation, you need such type of function that can produce multiple output result from a single function. The output parameter C# lets your program to return multiple values. In the preceding example, we created a method that accepts two input parameter and returns two out value. In this chapter you learned about what is out parameter and how to use out parameter in C# programming. In next chapter you will learn about Command Line Argument in C#.